Gemstones from space? Is there really such a thing? Actually, yes, there is a variety of meteorites and impactites that are used as gemstones. At times they are small enough to be used unaltered in the same condition that they fell from the heavens. Iron meteorites are alloys of nickel and iron that can be polished and used as components of jewelry or cut and polished and used as gemstones. Stony-iron meteorites are called Pallasites and they carry colorful crystals called Olivine or Peridot that are cut into beautiful green gems. 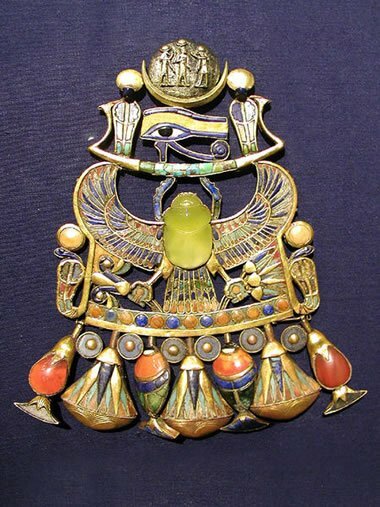 The stunning colorful glasses of Impactites have been carved into lovely small glass sculptures, cut into cabochons, and faceted to become gorgeous gemstones. 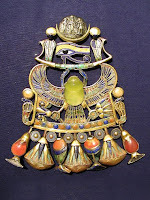 Extraterrestrial gems are used by people who practice complementary or alternative medicines. They believe that these space gems have special properties that help to promote healing and a healthy well-being, though there is no scientific evidence of their effect. Moldavite: Moldavite (also called Bouteille Stone) is an amorphous glassy material, a mineraloid, that is usually olive green in color. It is thought to have formed during an asteroid impact about 15 million years ago in central Europe. The impacting body hit with a high enough velocity to melt and splatter the target rock across a strewn field that includes portions of what is now the Czech Republic, Austria, and Germany. Most of the splatter solidified in the air and fell to Earth in the Czech Republic. Today it is found in sediments of Middle to Upper Miocene age as droplet-shaped particles of green glassy material a few centimeters in diameter or smaller. Meteorite experts have named such materials "impactites." 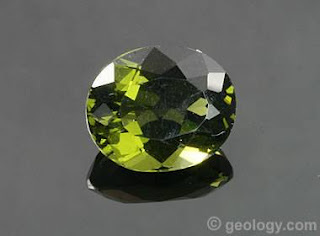 Gem-quality moldavite is often faceted or cut en cabochon and sold as a novelty gem. Nice pieces of rough with an attractive shape and color are often wire-wrapped or drilled and used as pendants or earrings. Many uncut specimens are purchased by meteorite and mineral collectors. Moldavite has to be used with care because it is about the same hardness as glass (5.5) and is brittle. It is best used in earrings and pendants. Faceted moldavite is mounted into jewelry and sold as a novelty gem to collectors. This novelty market has existed since the early 1900s, and the demand for moldavite gems was higher than the availability of natural material. So, enterprising people began faceting "moldavite" from green bottle glass, and glass workers in China began manufacturing green glass in just the right colors. These imitations have been entering the marketplace for over 100 years. Most of the time they were not disclosed as imitation. Today, the marketplace is still full of fake moldavite. Genuine moldavite usually has abundant gas bubbles, it often has visible flow structures, and it often has wiry inclusions of lechatelierite which are easy to see because of their low relief. If you are purchasing moldavite online, there is a really good chance that you will receive imitation material. That's what we received when we purchased the green faceted "moldavite" shown above - it's a fake - and the seller did not disclose that! This imitation moldavite is about 13 millimeters x 11 millimeters in size and weighs a little over 6 carats. Most real moldavites that are faceted for jewelry use or collectors are much smaller. The largest market for gem and rough specimens of moldavite is in alternative and complementary medicine. Some of the "moldavite" being offered in that market is going to be fake. The buyer should beware. There is no scientific proof that moldavite has any medical effectiveness, and some of the moldavite being sold in this market isn't even the real thing! In the 1980's, scientists discovered that there are nanometer-sized diamonds found in some meteorites in great numbers. In fact, scientists say that three percent of all the carbon found in meteorites are nanometer-size diamonds. Who knew! The world of gemstones just got more interesting! We love it! Look for more information on our worlds apparent gemstone collection. We find it fun and fascinating and we hope you do too.